I do not like the Monang character and the whole house-help subplot. The actress is okay but perhaps it is the character itself that has the problem. Her combination of deep Tagalog dialogue and her overall demeanor is way over the top and translates as corny. It is just a good thing that she and the Jograd character form a rather funny tandem that occasionally steals the show. Having said that, the actor who plays Jograd does steal the show, specially after doing a complete 180 character shift from promiscuous houseboy to flamboyant homo. The attention of the audience was pinned on him most of the time. Formula works every time. Remember Felix Rivera in Avenue Q? Ciara Sotto can sing but there are several instances in which her voice is drowned by the louder musical accompaniment, which does not seem to happen to the rest of the cast. Acting is not spectacular but tolerable enough. It is cool how people from TV seem to get better when they cross over to the stage. Perhaps it is the live setting. Nice to see Fredison Lo singing in Tagalog after his stint in Rent. However he got the geek role again, might get typecast. Support cast is good, specially the bar girls. I suppose they are not really bar girls, but they are convincing enough, and the lively numbers come in as a bonus along with the punchlines. The actors playing Mark's parents and sister are awesome singers, and most of their duets are really appreciated by the audience. The only problem with the story is what seems like the very convenient change of heart of Mike's father after a not so convincing pep talk from Monina. Since he is not present onstage for a long time, that moment seems a bit abrupt given that the only background info we have about him is that he failed to reach his musical dream when he was young, and it was not even a flashback but rather just mentioned by his daughter. It is as if he just accepts everything since he has no choice because the show is ending. Best song number would be the finalé by Myke Salomon. 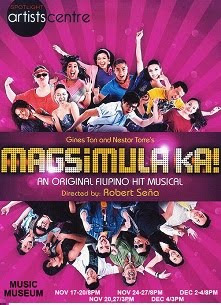 That Magsimula Ka song is just so uplifting, does not fail to tug a heart string, and really boosts one's morale. Good thing he has pretty powerful vocals too, captures the essence of the song.